A torrent of flagship smartphones will be upon us and a slew of them will be fueled by none other than Qualcomm’s Snapdragon 855. With the chip maker having given orders to TSMC, the foundry is ready to produce the Snapdragon 855 on a commercial scale to cater to several customers ranging from Samsung, Xiaomi, LG, Nokia, and countless others. With Qualcomm’s orders, TSMC can also expect to generate a healthy revenue, and down the road, the situation for the foundry might improve. According to a report published by DigiTimes, TSMC saw reduced revenue due to weakness in orders for iPhone chips, and the company’s revenue is not expected to pick up until July. TSMC has estimated first-quarter revenues at between $7.3 billion USD and $7.4 billion USD, with the aforementioned figure down by about 14 percent compared to the same period in 2018. The latter was during the time TSMC enjoyed a surge in orders for crypto mining ASICs. However, thanks to the competitiveness of its 7nm technology, the foundry will be able to outperform the industry. 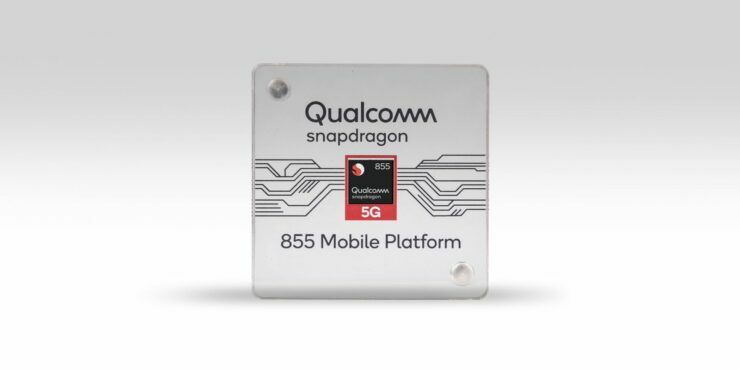 As for the Snapdragon 855, we’ll recap on its specifications in order to bring you up to speed. Firstly, the SoC features a multi-core AI engine which Qualcomm claims to deliver up to 3x better AI performance compared to the previous mobile platform, the Snapdragon 845. The Snapdragon 855 also comes with Computer Vision (CV) ISP for enhanced computational photography, and it sounds very similar to Google’s Night Sight feature for Pixel devices, thus substantially improving imaging in low-light areas. Qualcomm also states that the Snapdragon 855 is optimized for gaming, with a new feature called ‘Snapdragon Elite Gaming’. The silicon will also be able to handle augmented reality-related tasks with ease, with support for 8K 360-degree video playback. As for the CPU, the Snapdragon 855 features eight Kryo 485 cores running up to 2.84GHz. According to previous reports, there will be a single core running at the aforementioned clock speed, and that core will be paired with three 2.42GHz performance cores. Lastly, the less intensive tasks will be handled by four power-saving cores, each having a clock speed of 1.78GHz. The GPU running in the SoC is the Adreno 640, and it supports Vulkan 1.1. 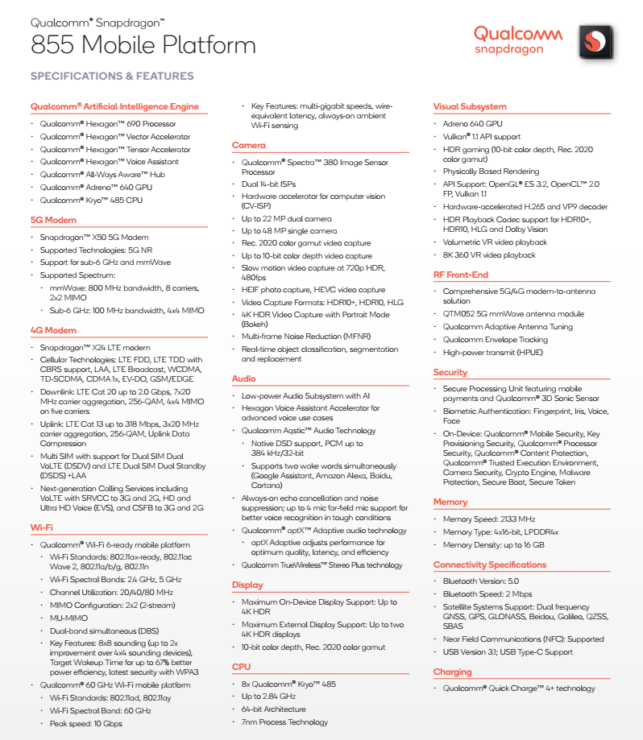 A boatload of its specification details have been given in the image above, so if you want, you can learn more about Qualcomm’s latest and greatest SoC there. iPhone Models Launching in 2020 Reportedly Featuring 5nm Chips From TSMC – A14 Expected to Be Ultra-Efficient?